Lomatia ilicifolia is an understory plant from woodland areas in south eastern Australia. It grows naturally in part shade and makes a good foliage plant in home gardens. The foliage is toothed giving it a holly like appearance, hence the common name. We think this is a garden worthy plant in terms of providing strong textures foliage in shaded areas of the garden. It is easy care and will attract butterflies to the garden when in flower. Although at least 9 species of Lomatia have been identified, none are readily available at major nurseries. You local indigenous or community nursery is more likely to carry them. Grow Laomatia ilicifolia in a part shaded position in a humus rich well drained soil. It is a plant that can be tip pruned after flowering to maintain shape and size. Common Name – Holly Lomatia. Origins – South eastern Australia. Height – To around 1 to 2 metres. 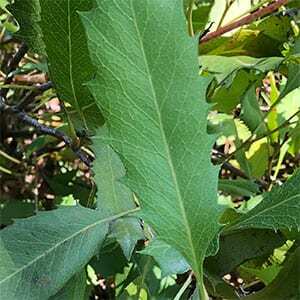 Foliage – Oblong green foliage turning darker with age.